The Tiger Groove Corbett Resort, the one and only resort which provides its exclusive customers an amazing view into the wild life of Corbett National Park through a 5 km safari while approaching the destination along with the luxurious affordable living and delicious food. Away from the bustle of the city at Tiger Groove Resort, you will get an oasis of comfort, in surrounding that are as perfectly suited to relaxed and successful conference, activities as they are for taking a restful break. The Tiger Groove resort is located in the heart of the village Kyari (Corbett Buffer Area) and directly opposite to the Osani River, it is only 8 km from Ramnagar towards Nainital, situated on the foothills of Himalayan belt which has various geographical and ecological characteristics with splendid landscapes. Hotel Tiger Groove Resort have a multi cuisine restaurant where you will be treated with genuine and cordial hospitality with delicious Indian buffet, International cuisines and regional classics. Conference Hall - Therea re 2 conference hall which can accommodate 100 people in one and 60 people in another hall. The versatile and stylish conference centre is also available for seminars and private celebrations. - 50% Retention to be charged if cancelled 15 days before scheduled Check-in. - NO REFUND Retention will be charged if cancelled 7 days before the scheduled Check-in. - 80% Retention will be charged if cancelled within 25 days before Check-in or no-show. - Accommodation in chosen category. - Meals as per plan opted. 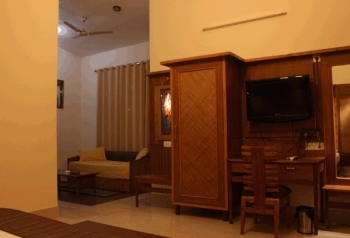 - Tea & Coffee maker in each room. - Recreational activities in resort. - Nature walk once during the stay. - Born fire in evening on request. -In between 5 - 12 years Rs. 1000/- per kid per night with bed and meals. -In between 12 - 15 years Rs. 1500/- per kid per night with bed and meals. -Above 15 years Rs. 2000/- per person per night with bed and meals. The nearest airport to Tiger Groove Corbett Resort is Delhi which is 275 kms. By Road Delhi is 250 Kms, the nearest Railway station is Ramnagar (8 Kms) and Kathgodam is 63 Kms from the resort. 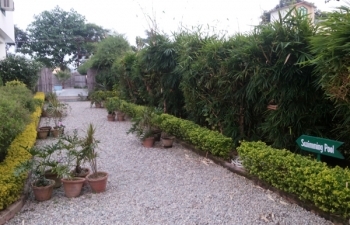 The resort is only 8 Kms from Ramnagar towards Nainital on Haldwani road.